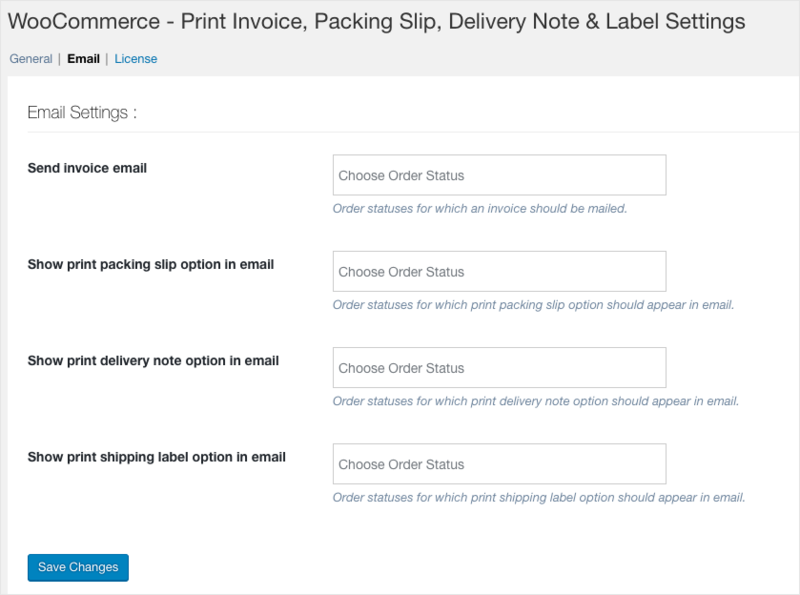 This article explains how to set up Print Invoice, Packing Slip, Delivery Note & Label Plugin for WooCommerce. To know more about the features of the plugin, refer to the Product page. 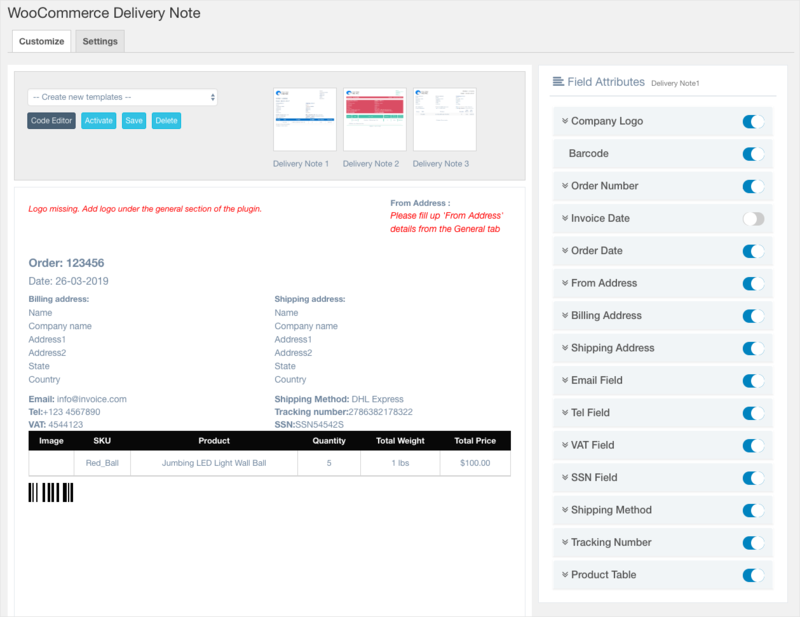 Print Invoice, Packing Slip, Delivery Note & Label Plugin for WooCommerce generates the invoice, packing slip/list, delivery note, shipping label, dispatch label and address label for an order. 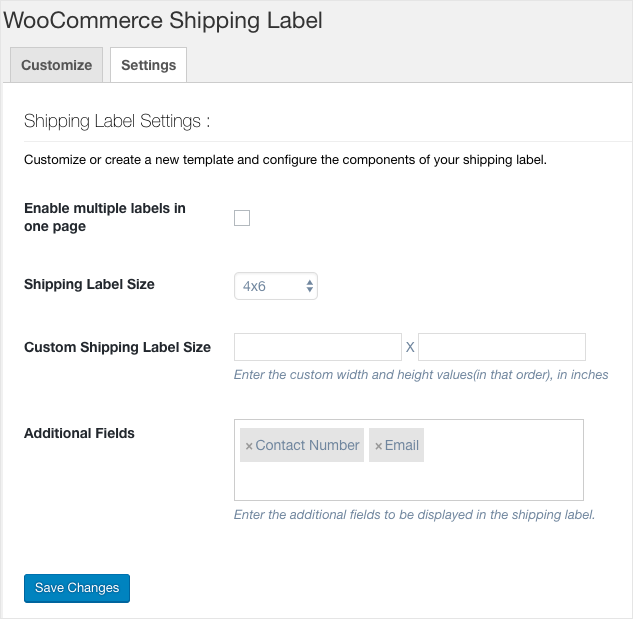 You can easily print invoices, packing lists, shipping labels, and delivery notes as well as download dispatch labels, address label and shipping labels from the WooCommerce Orders dashboard. You can also print these in bulk. You will be able to add your company name, custom logo, return policy and custom footer on all these shipping documents like invoice, packing slip, delivery note, shipping label, or dispatch label. In addition to this, there are standard templates available for Invoice, Packing Slip and Delivery Note. You can create custom templates from the standard ones. Based on your requirements, you can customize field attributes like Order number, Order date, Invoice number, From address, Billing address, Shipping address, Shipping method, Tracking number and so on. This document intends to provide detailed, step-by-step instructions that’ll help you set up this plugin. After purchasing the Print Invoice, Packing Slip, Delivery Note & Label Plugin for WooCommerce, the plugin will be available as a zip file in the API Downloads section of your MY ACCOUNT page. Download the zip file from API Downloads by logging into your WebToffee MY ACCOUNTS page. Navigate to Plugins > Add New to upload the downloaded plugin. Choose the plugin file to upload. Once the activation is successful, the user will be directed to the Dashboard. 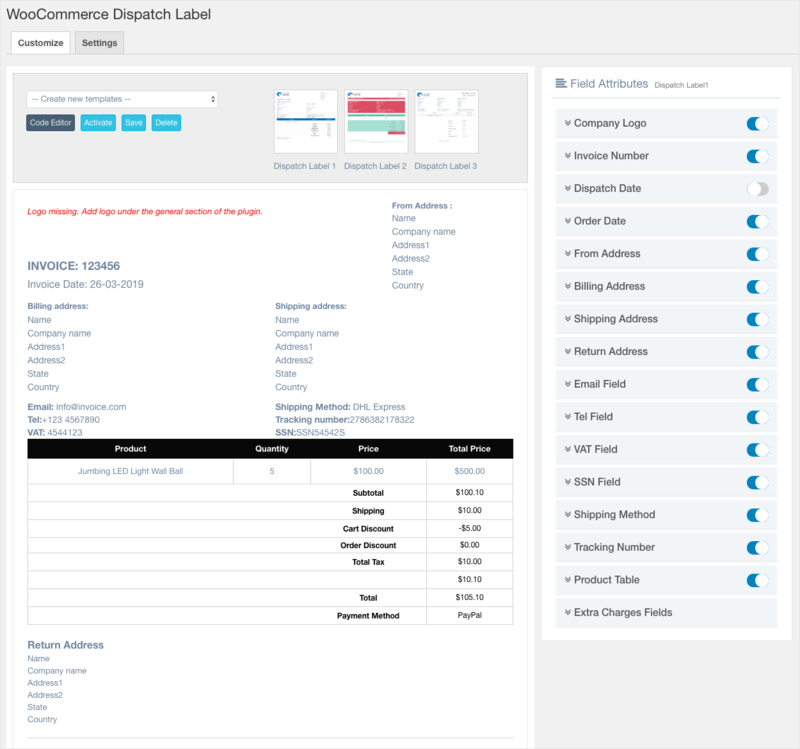 The Dashboard provides modularized access to various labels like the General Settings, Invoice, Packing list, Shipping Label, Delivery Note, Dispatch Label, Address Label, Email Settings, License. Henceforth, you can use the side menus or the dashboard to navigate to the respective labels. Plugins > Installed Plugins > Print Invoice, Packing Slip, Delivery Note & Label Plugin for WooCommerce > Settings. General settings consist of generic configurations like setting up the company name, custom logo, return policy and custom footer. You can also set up ‘Shipping From’ address, packaging types and other essential information. These settings define the basic configuration for all shipping documents (Invoice, Packing Slip, Delivery Note, Shipping Label and Dispatch Label). Enable – Enable the item that is required for your site. Company Name – Enter your company name. Custom Logo – A custom logo or image for all printable objects. Enter URL of the image to be used. This logo will be placed on the top left corner of the shipping document. Return Policy, Conditions, etc. 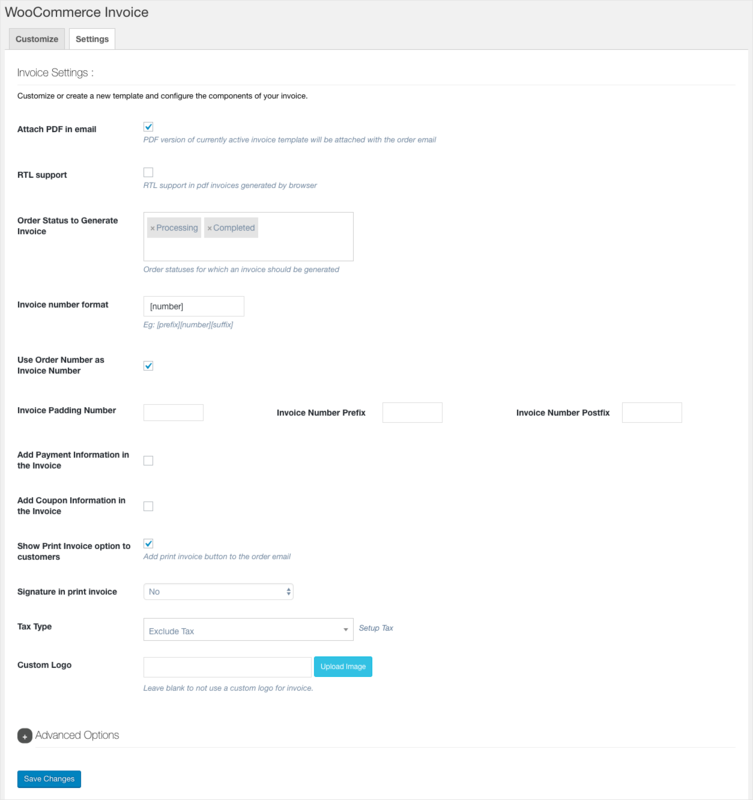 – You can set return policies, conditions and so on in the given text area section. Custom Footer – You can set custom footers for all shipping documents. This address will be displayed in the invoices, packing slips, delivery notes, and labels. Sender Name – Enter the name of WooCommerce shop owner. Sender Address Line1 – Enter the first line of the address, which is mostly the street name and number. Sender Address Line2 – Enter the second line of the address, which can be the apartment number. Sender City – Enter the city name of the sender. Sender Country – Enter the country name of the sender. Sender Postal Code – Enter postcode from where you are shipping items. Click the icon to reveal the Advanced options. 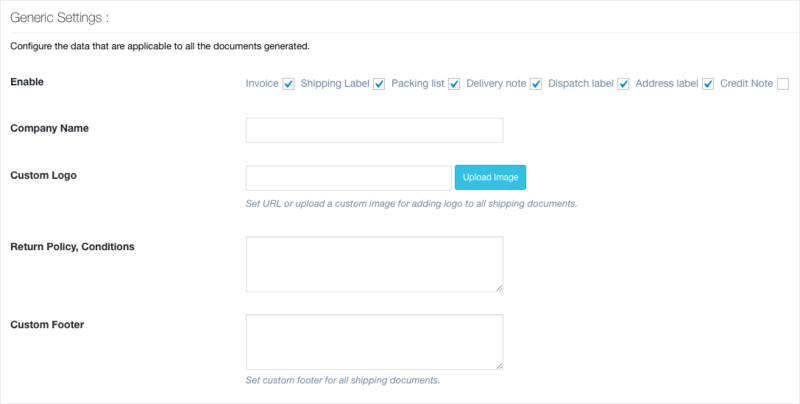 Preview Before Printing – You can enable this option to preview all the shipping documents before they are printed. Include DataMatrix (Bar Code) Information – Check this option to add data matrix information on the Invoice and Shipping Label. A DataMatrix is a one-dimensional matrix bar-code consisting of black and white modules arranged in a rectangular pattern. The length of the encoded data depends on the number of cells in the matrix. The information to be encoded can be either invoice number on the invoice or shipment tracking number on the shipping labels. 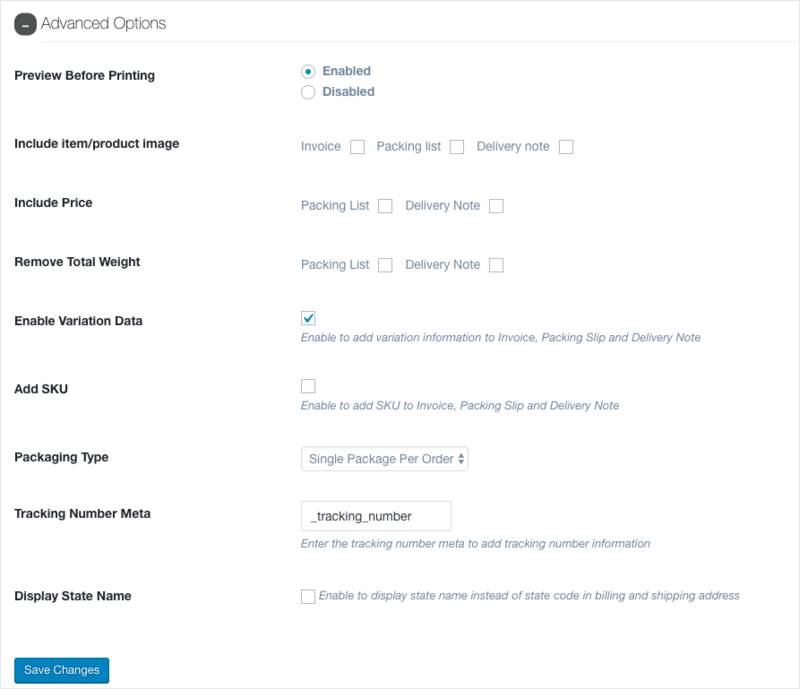 Enable Variation Data – Enable this option to add variation information to the Invoice, Packing Slip and Delivery Note. Add SKU – Check this option to show SKU on Invoice, Packing List and Delivery Note. Packaging Type – The packaging type that you set here can be applied to all shipping documents, except Invoice. 1) Pack Items Individually: Allows you to pack each item in the cart separately. Total Shipping cost is calculated by adding the shipping cost of each item. To define a new box size, click the Add Box button. All cart items are packed into custom boxes defined in Box Size settings. The best fit box is chosen automatically from the defined boxes. This box dimension and weight settings are applicable only when Box Packing is selected. Based on your requirement, you can enable or disable a particular box using the checkbox under Enabled column of the respective box rule. For more information about box packing, see How to configure Box Packing to Print Label & Packing List using Print Invoice, Packing Slip, Delivery Note & Label Plugin. 3) Single Package Per Order: Allows you to pack all items of a single order as one single package. Download the big5.ttf font file by clicking this link. Go to the plugin folder through FTP. Navigate to wp-contents > plugins > wf-woocommerce-packing-list > wf-template > pdf-template > font > unifont. After uploading big5.ttf, you get an additional selection – Big5 along with Default in Font drop-down list option. Default: Allows you to print English characters. Big5: Allows you to print Chinese characters. This depends on the text in the text box. If the text is in Chinese, then you can see the Chinese text on the print documents. If the text is in English, then you can see the English text on the print documents. Note: By default, the font is Arial. Once it is changed to Big5, even English text gets printed in Big5 font. Tracking Number Meta: This option helps in adding a tracking number to your shipping document. Based on the shipment tracking extension you use, you can enter the respective tracking number meta value in the given text field. Display State Name: By default, the state code is displayed in all addresses of shipping documents. You can tick this option to display state name instead of state code. Once all the settings are configured, click the Save Changes button. Email settings help in configuring email settings related to Invoice, Packing Slips, and Delivery Notes. These settings allow you to attach invoice, packing slips and delivery notes with emails based on order status. Sent Invoice Email – Allows you to attach invoice with the email. You can select the order status for which invoice has to be attached with email. You can send the invoice as a separate email by ticking the Send as a separate mail option. Else, uncheck it to send it with the order status email(s). Sent Packing Slip Email – Allows you to attach the packing slip with the email. You can select the order status for which packing slip has to be attached with email. Sent Delivery Note Email – Allows you to attach the delivery note with the email. You can select the order status for which delivery note has to be attached with email. Sent Shipping Label Email – Allows you to attach the Shipping Label with the email. You can select the order status for which Shipping Label has to be attached with email. The selection of order status in the above three settings depends on the order status selected in the Order Status to Generate Invoice setting of Invoice setting. You can customize and create a new template of an invoice from the existing templates or create a custom template by personalizing the existing standard template. The Invoice settings section consists of various settings for customizing invoices, setting order status for which invoices have to be printed, adding payment and coupon information in the invoices, setting custom logo, adding custom fields on checkout page and invoices, setting custom footer, and so on. Attach PDF in the email: PDF version of the currently active invoice template will be attached with the order email. RTL Support: RTL Support in PDF invoices generated by the browser. 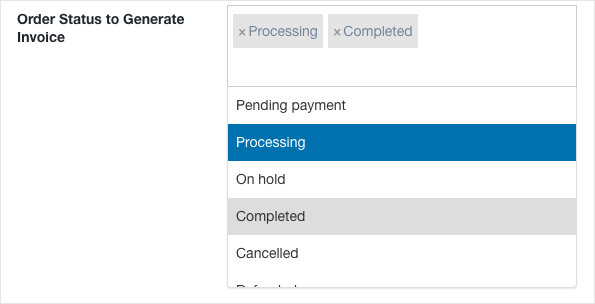 Order Status to Generate Invoice – This option lists all the order status for which invoices can be generated. You can select multiple statuses based on your requirement. Use Order Number as Invoice Number – The plugin allows you to use order number as the invoice number. You need to tick the checkbox to enable this. Invoice Start Number: Enter the Invoice Start Number. Invoice Padding Number: Enter the padding number so that invoice number is padded by zeros. For example, if the start number is 1 and the padding number is 4, then the invoice number will be shown as 0001. Invoice Number Prefix: Enter the prefix which will be added before the invoice number. For example, if the prefix is WF, then the invoice number will be shown as WF0001. Invoice Number Postfix: Enter the suffix which will be added after the invoice number. For example, if the suffix is WF, then the invoice number will be shown as 0001WF. For example, if the invoice start number is 0001, padding value is 6, prefix value is 170_[d] and postfix value is [Y], the invoice number will be generated as 170_270000092017. Where, value 27 corresponds to current date and value 2017 corresponds to current year. Add Payment Information on the Invoice – Allows you to add payment information on the invoice. This information is generally the payment method used. 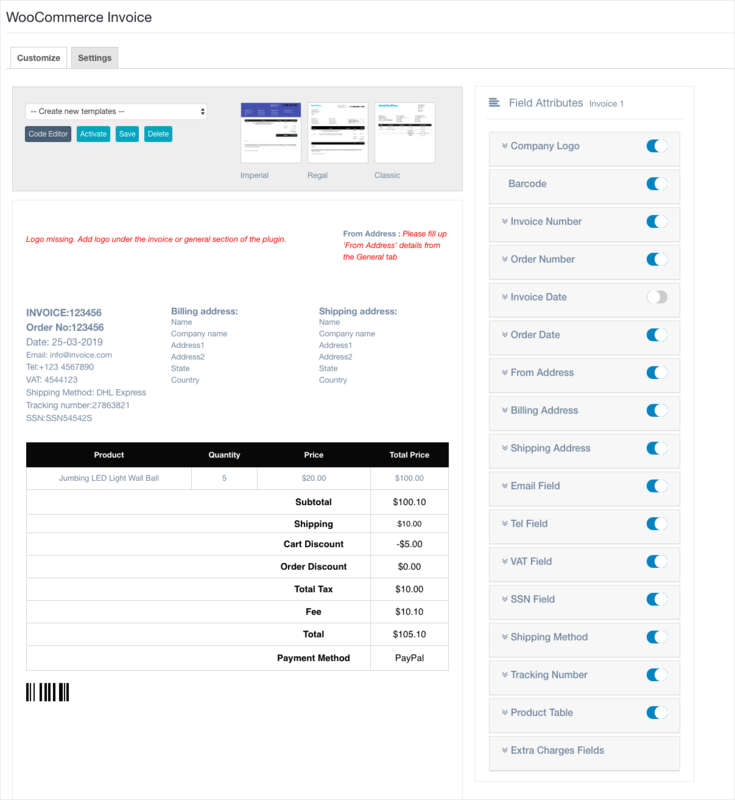 Add Coupon Information on the Invoice – Allows you to add coupon information to the invoice. This information includes coupon code and the calculated discount amount. Show Print Invoice option to customers – You will able to display a print invoice button for your customers. Manual Signature: Provides an option to sign manually in the invoice. Image Signature: Enables you to add an image of your signature. Once you select this option, a new textbox option is provided to enter the image URL. Tax Type – Allows you to configure whether to include or exclude tax information on the invoice. Custom Logo – Allows you to set a custom logo for invoice. This logo will be replaced by the custom logo set in the General settings. If you leave this field blank, then the logo from the General settings gets printed on the invoice. Click the icon to reveal the Advanced options for invoice. Additional Fields on Checkout Page – Allows you to configure SSN, VAT and/or Codice Fiscale information to be added by the customers during checkout to pay the tax. You can also create custom fields to be inserted on the checkout page, by clicking the Add Custom Field button and specifying the field name. Additional Fields on Invoice – Allows you to add additional fields on the invoice. You can select a field from the list of default fields or click the Add Existing Order Meta Field button to create custom meta fields. Enter a custom Field Name and the respective meta key for the field. 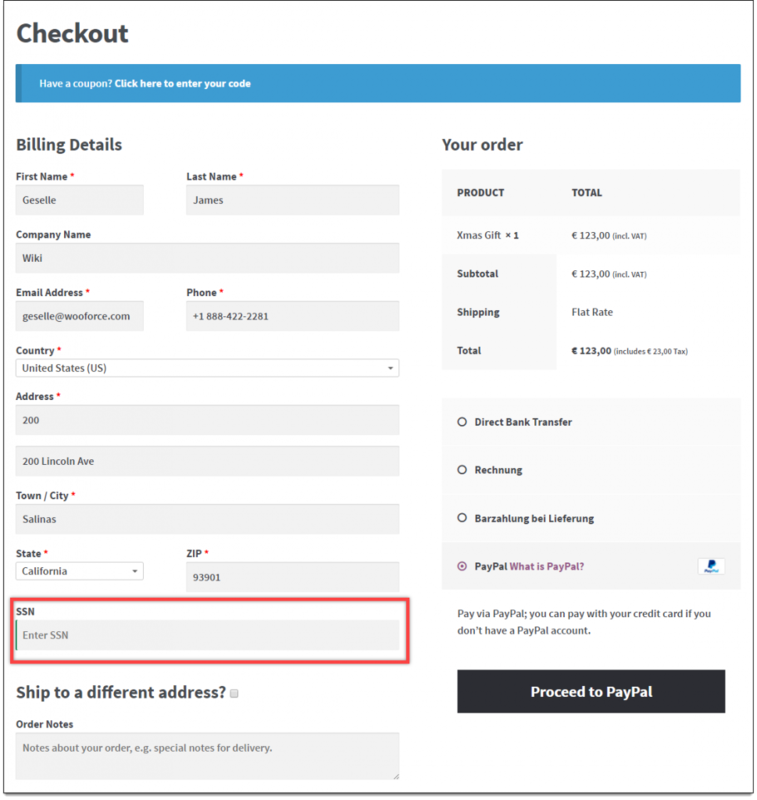 The order meta keys can be found in the custom field section in the WooCommerce Order page of a product. Product Meta Fields – Allows you to add fields related to the products in the invoice product table. Click the Add Product Meta to add a new product meta field. Enter a custom Field Name and the respective meta key for the field. The product meta keys can be found in the custom field section of the product page. Custom Footer – Allows you to set custom footer for invoice. If no footer text is set here, the default footer text from the General settings is applied. You can customize and create a new template of a packing slip from the existing templates else create custom templates by personalizing the existing standard template. 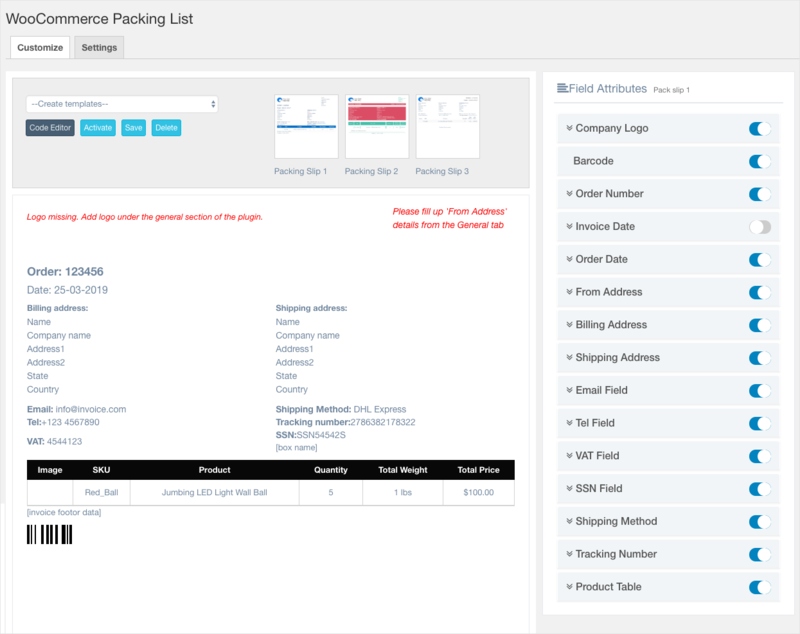 The Packing List settings section helps you in configuring all the settings related to packing slips such as customizing packing slip templates, inserting product image & price, and adding additional fields (in the packing slips). Group by Category: Check this option to group the products by category. 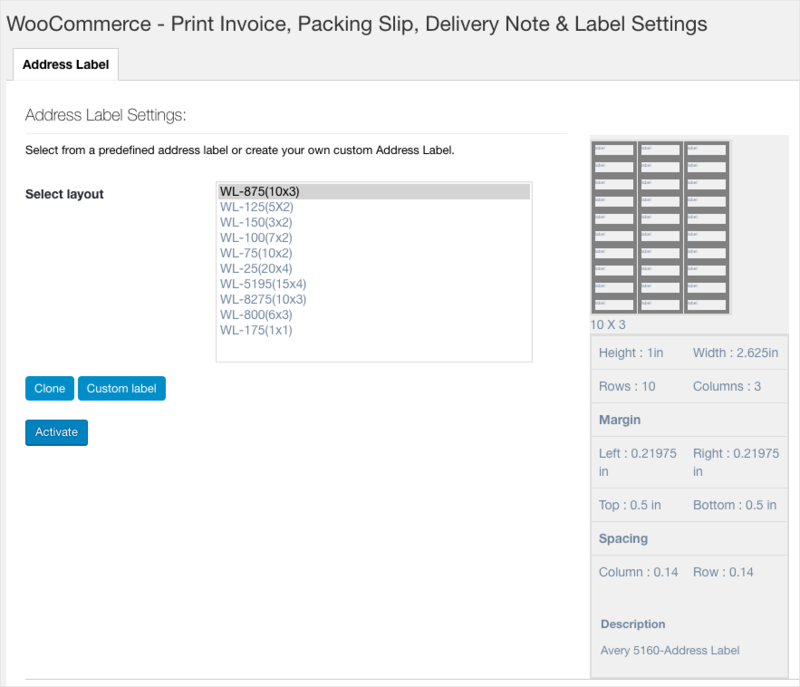 Additional Fields – Allows you to add additional fields in the packing slips. You can select a field from the list of default fields or click the Add Existing Order Meta Field button to create custom meta fields by providing a custom Field Name and the respective meta key for the field. 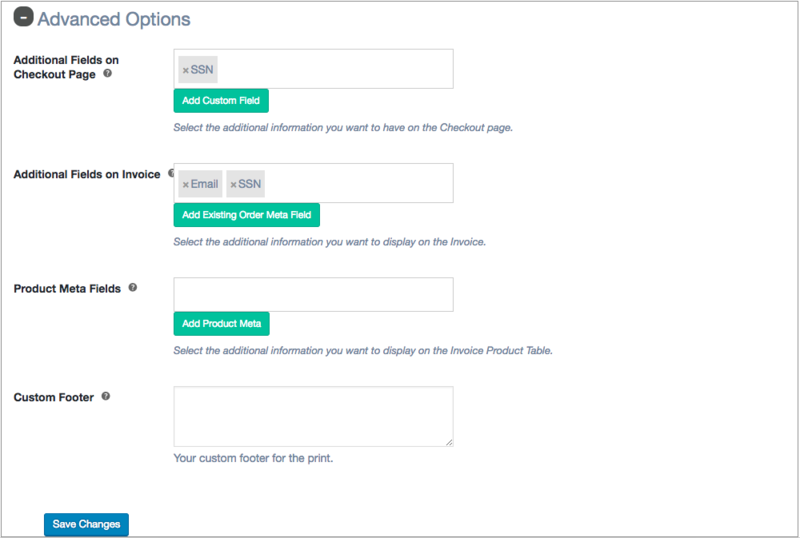 The order meta keys can be found in the custom field section in the WooCommerce Order page of a product. Product Meta Fields – Allows you to add meta fields related to the products in the packing slip product table. Click the Add Product Meta to add a new product meta field by providing a custom Field Name and the respective meta key for the field. The product meta keys can be found in the custom field section of the product page. 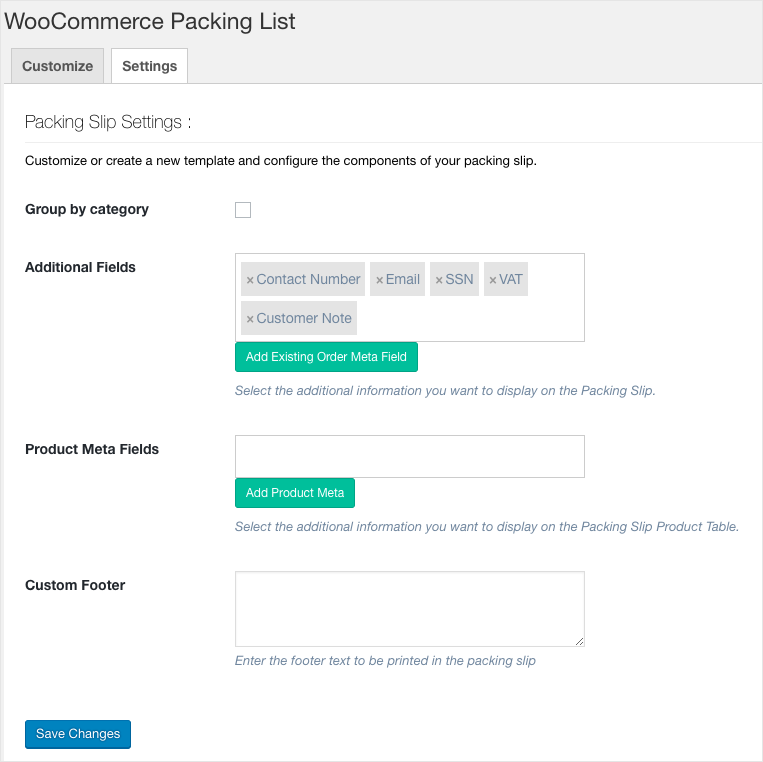 Custom Footer – Allows you to set custom footer for packing slips. If no footer text is set here, the default footer text from the General settings is applied. You can customize and create a new template of a shipping label from the existing templates or create custom templates by personalizing the existing standard template. Shipping Label settings are used to configure label settings such as setting the size of the shipping label and including additional fields in the label. Shipping Label Size – Allows you to set the size of the shipping label. This size is only applied for the shipping label and not for invoice, packing slip, delivery note, and dispatch label. Full Page: This option allows you to print the label which will be spread over the full page. The printing depends on the browser printing option. 4 x 6: This option allows you to print the label of size 4 x 6 inches. Custom Shipping Label Size – If the above shipping label size does not match your requirement, you can configure custom shipping label size of your own. You can enter label size values in terms of width and height. 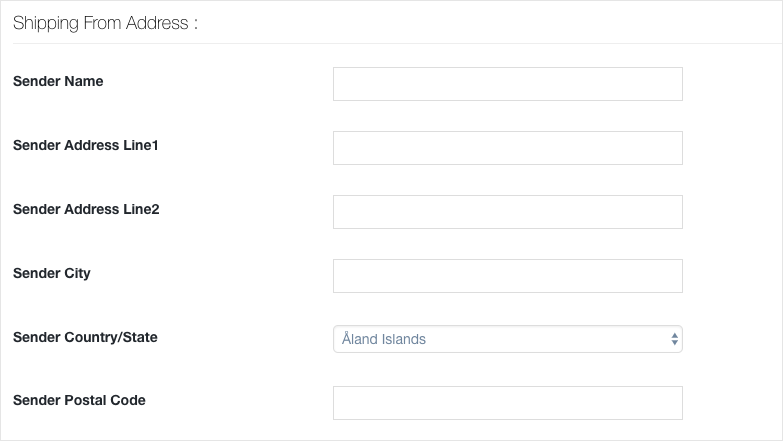 Additional Fields – Allows you to add additional fields to the shipping labels. A delivery note is a document which contains order information such as product description, quantity and so on. A copy of the delivery note signed by the customer is returned back to the seller for confirmation of shipment. You can customize and create a new template of a delivery note from the existing templates or create custom templates by personalizing the existing standard template. 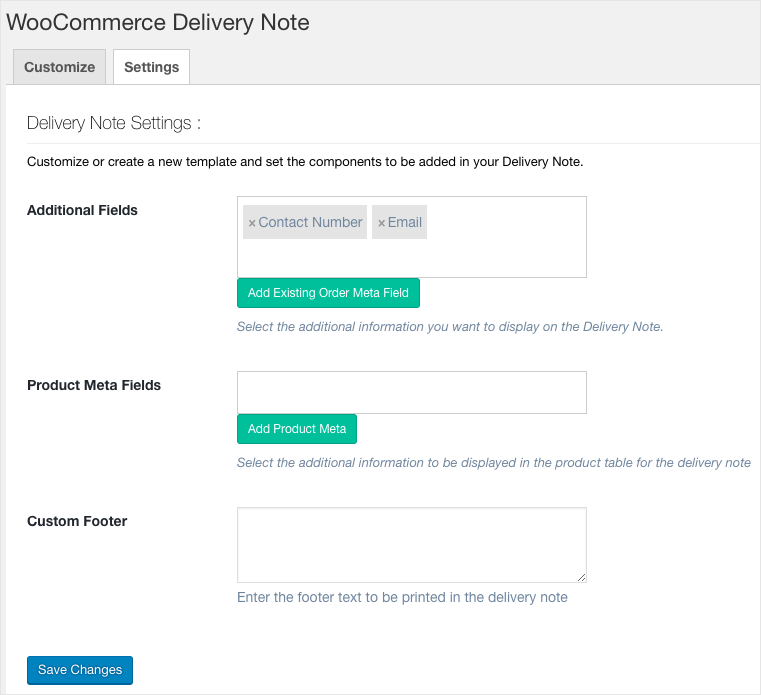 The Delivery Note settings section helps in customizing delivery note templates and configuring additional fields in the delivery note. Additional Fields – Allows you to add additional fields in delivery notes. You can select a field from the list of default fields or click the Add Existing Order Meta Field button to create custom meta fields by providing a custom Field Name and the respective meta key for the field. 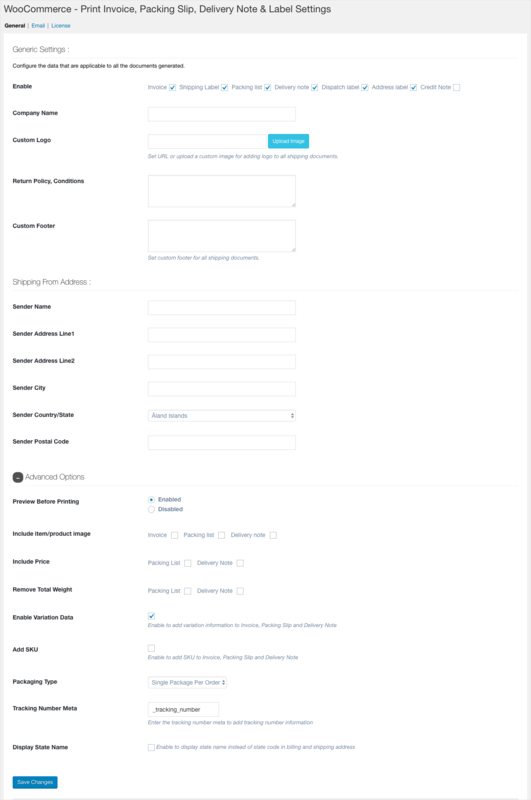 The order meta keys can be found in the custom field section in WooCommerce Order page of a product. Product Meta Fields – Allows you to add meta fields related to the products in the delivery note product table. Click the Add Product Meta to add a new product meta field by providing a custom Field Name and the respective meta key for the field. The product meta keys can be found in the custom field section of the product page. Custom Footer – Allows you to set custom footer for delivery notes. If no footer text is set here, the default footer text from the General settings is applied. For more information about the delivery note, see How to print Delivery Note using Print Invoice, Packing Slip, Delivery Note & Label Plugin. A dispatch label is a document that is dispatched with all the packages. It contains product information, payment method information, total cost amount, billing address, shipping address and from address. It also contains the return address, in case, customers want to return the product. You can customize and create a new template of a dispatch label from the existing templates or create custom templates by personalizing the existing standard template. 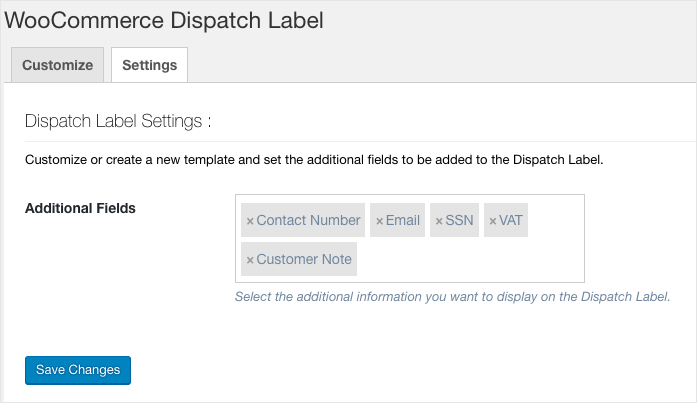 Additional Fields – Allows you to add additional fields in dispatch labels. You can select from a predefined address label or create your own custom Address Label. Select the desired layout with predefined dimensions from the list. As the user traverses through each layout from the list, its dimensions will be displayed on the right side. However, the user can make changes to the existing layout by clicking on the Clone or create an entirely new layout by clicking on the Custom Label button. Once an address label layout is selected, Activate it for using it further. For more information about dispatch label, see How to Download Dispatch label PDF using Print Invoice, Packing Slip, Delivery Note & Label for WooCommerce Plugin. 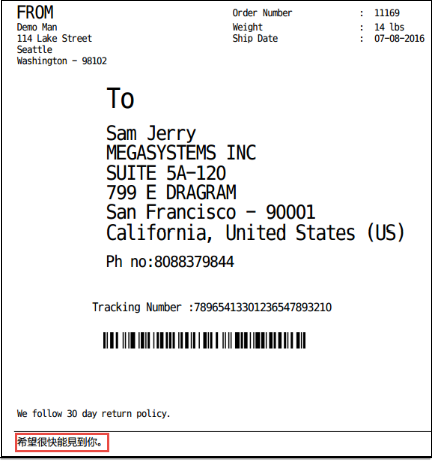 Now that you understood how to configure the plugin, let’s see How to Customize Invoice, Packing Slip and Delivery Note. This entry was posted in Documentation, Getting Started, Print Invoice, Packing Slip, Delivery Note & Label for WooCommerce, WooCommerce. Bookmark the permalink.